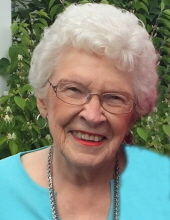 Dorothy McNee, age 94, of Ames passed away April 7, 2019. A visitation will be held from 12:30 -1:30 p.m. Saturday, April 13 at Adams Funeral Home, 502 Douglas Ave., Ames with a Celebration of Life Service beginning at 1:30. Dorothy Marilyn McNee was born September 23, 1924 near Mallard, the daughter of Burt and Grace (Hanson) Law. Dorothy married John C. McNee on September 18, 1944 in Ft. Dodge, Iowa. She was a secretary to the director of WOI AM/FM/TV and later employed at the Ames Laboratory, Iowa State University, retiring in 1994 as an Administrative Specialist. Dorothy was a lifelong supporter of Iowa State University Athletics, lifetime member of The National Cyclone Club and The Memorial Union. She was a member of Collegiate Presbyterian Church and enjoyed volunteering most of her time with the annual rummage sale. She is preceded in death by her parents, husband, John; brothers, Tom Law and Wilbur Law and brother-in-law, Jim Bowden. Dorothy is survived by her sister, Mavis Bowden, of Humboldt; sister-in-law, Dolores Law of Humboldt and many nieces and nephews. In lieu of flowers, memorials may be directed to Collegiate Presbyterian Church. To send flowers or a remembrance gift to the family of Dorothy M McNee, please visit our Tribute Store. "Email Address" would like to share the life celebration of Dorothy M McNee. Click on the "link" to go to share a favorite memory or leave a condolence message for the family.